Montgomery College Television Montgomery College Television	 "Campus Conversations" is a 30-minute series that explores a variety of issues, events, and topics of interest to the Montgomery College Community. Embed "Beyond MC: Transferring to a 4-Year School" on your page. Embed "MC Student Success Stories" on your page. Embed "Preparing for College" on your page. Embed "Building for the Sciences at MC" on your page. Embed "Being LGBT on Campus" on your page. Guests discuss the global economy, the importance of having a global perspective in our education, study abroad and other ways that Montgomery College is interacting with the world to share information. Embed "Global Education" on your page. Embed "Lasting Impact of 9/11" on your page. Faculty, staff and a student talk about innovation in the classroom here at Montgomery College. Embed "Innovation in Education at MC" on your page. On this episode of Campus Conversations: We talk to Melissa Gregory, Montgomery College’s Director of Financial Aid, and Megan Harper, a student who works in the Office of Financial Aid about the application process, deadlines and how best to get the assistance you need. And we discuss Montgomery College Foundation Scholarships with David Sears, Montgomery College Vice President of Advancement; Lena Barnett, who donated funds to the Montgomery College Foundation; and Heather Baumgardner who received a Montgomery College Foundation Scholarship. Embed "Financial aid and MC Foundation Scholarships" on your page. In Late October, Scientists, physicists, and engineers from across the country came out in droves to show others how cool science can be. The USA Science and Engineering Festival Spanned several weeks and held events across the country, including a huge expo on the mall in Washington, D.C. And as part of the festival, Montgomery College Professor, Susan Bontems was part of a group called the "Nifty Fifty". This group of 50 professionals went out to middle and high schools to share their excitement about science careers with students. 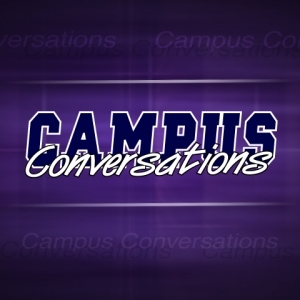 On this episode of Campus Conversations we talk to Professor Bontems and Professor Margaret Latimer who nominated her for the program and we visit some Montgomery College students and faculty as they participated in the Expo on the National Mall. Embed "USA Science and Engineering Festival" on your page. A Conversation with Montgomery College's new president Dr. DeRionne Pollard. Embed "Campus Conversations with Dr. DeRionne Pollard" on your page. For Frank Warren, PostSecret began as an experimental art project. It has become an international phenomenon and years later is still going strong. We talk to Frank Warren and Psychology Professor, Melissa McCeney about PostSecret. Embed "Episode 63" on your page. This episode focuses on financial aid, enrollment and support programs for students affected by the economic downturn. Embed "Episode #62 - Montgomery College in a Difficult Economy" on your page. Embed "Episode #61 - World Music at Montgomery College" on your page. On this episode we explore how some Montgomery College faculty have integrated service learning activities into their coursework, giving students the opportunity to bring what they are learning in the classroom out into the community. Embed "Episode #60 - Service Learning and Volunteerism" on your page. On this episode, we explore the Smithsonian Faculty Fellows program. We talk to coordinators and to faculty about the program and how they are able to bring the Smithsonian experience into the classroom. Embed "Episode #59 - Smithsonian Faculty Fellows Program" on your page. As the economy continues to spiral downward, some experts suggest that we will see an upswing in crime. On this episode of Campus Conversations, guests discuss how you can keep yourself and your property safe and secure. Embed "Episode #57 - Personal Safety" on your page. Embed "Episode #58 - Montgomery College and Universities at Shady Grove Partnerships" on your page.